In a recent article, Miles and I discussed the divide between "saltwater" and "freshwater" macroeconomics. Of course some people claimed that this divide is a thing of the distant past, or mostly hype. But a new paper by Ali Onder and Marko Tervio shows that the divide is still a real thing. Instead of comparing theories or ideas, they simply look at who is citing whom. Applying cluster analysis to the citation networks, they find that economists from the American coasts ("saltwater") tend to cite other economists from the coasts, while economists from the interior of the country ("freshwater") tend to cite others from the interior. "Freshwater" and "saltwater" are cliques. This definitely fits with my own personal experience. Finance feels very non-balkanized. It feels less like macro, and more like the physics culture I remember from my undergrad days; people disagree on lots of stuff, but they stay abreast of what the other side is doing, and they're almost always willing to entertain and discuss competing ideas. And there seems to be less cliquishness - remember, Eugene Fama and Richard Thaler work in the same department. There's an easy explanation for why finance is the least divided: It has the best data. Financial data is high-frequency and very rich, has many clear natural experiments, and is supplemented by things like surveys and even experiments. Thus, it makes sense that in finance, data could win arguments, while in other fields it's not so easy to tell who's right. Even if the data doesn't definitively answer arguments - is long-run asset return predictability driven by behavioral spazzing, or by the time-varying risk premia of rational agents? - the proponents of competing ideas are at least forced to acknowledge and address each other's work. But this idea doesn't explain why econometrics is so divided. Econometricians work with every kind of data, so by definition they have the best. And econometrics is the branch of econ that is least dominated by complex theories. So why is there such a divide between "freshwater econometrics" and "saltwater econometrics"? It's a mystery to me; in terms of ideas, I have no idea what the big disagreements in 'metrics even are. Is it a frequentist/bayesian thing? Time-series vs. cross-section? Pure theory vs. applied? Hopefully some older profs can explain this to me. Of course, there are some other explanations for why econ might be divided. Politics is one; after all, the freshwater network is descended from the "Chicago school" of the 60s and 70s, and hence might just be more conservative. But I think we'd then expect to see public finance (taxes) and labor be more politicized than they are. Those are the fields that have the most importance for distributional questions, and distribution is what politics is mostly about. So politics doesn't seem like the main explanation here. Spatial proximity is also a candidate explanation, but doesn't explain why Berkeley cites Harvard more than it cites Chicago. So there's no obvious explanation that completely explains the freshwater-saltwater divide that we see. But it's real. And if you want to escape it, consider going into finance! Another thought. You've persisted with the view that when the science is crappy - whether because of bad data or some kind of bad equilibrium I guess - there is disagreement. When the science is good, apparently there is no disagreement. Here's something else that could be going on. In macro the stakes are big. Different decisions about macro policy could have big effects, and there are plenty of advisory jobs in governments and in central banks that macro people compete for. If you can convince people that your ideas are the best, then your tribe gets a bigger flow of resources. And convincing the people who hand out the money may not require good science, only a big mouth. What's at stake in finance? The flow of resources to finance people comes from Wall Street. All the Wall Street people care about is making money, so good science gets rewarded. I'm not saying that macroeconomic science is bad, only that there are plenty of opportunities for policymakers to be sold schlock macro pseudo-science. The possibility that macro tribalism is all about blatant resource-grabbing had of course occurred to me, but that's a little more cynical than I'm prepared to get! Update 2: Seeing Williamson's comment, Matt Yglesias points out on Twitter that successful macroeconomic modeling should be in huge demand on Wall Street. For example, if Wall St. firms were to learn that QE really does cause deflation - as Williamson's recent paper alleges - they should be able to make enormous profits. Williamson agrees. Perhaps labor and public finance tend to attract people who already lean left, so there is less political polarization among those economists (ie they are all saltwater)? That would be my inclination as well. They could be topics that attract people with a non-random set of political beliefs. Not sure about labor, but tax econ seems to attract people who think taxes are bad bad bad. Not the political left. 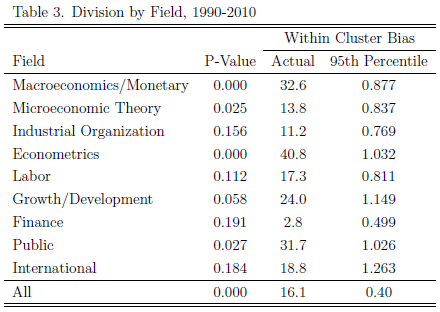 Just anecdata but the econ department at my scrub-tier public school (UW: Milwaukee) had a good proportion of labor economists and they were by-and-large Evian (which made the Madison protests of 2010 and their by-and-large support of same all the more entertaining). We had some IO guys who were fairly salt. I wasn't anywhere near smart enough to do proper econometrics (PreLaw Econ: I can hardly count without taking off my shoes) so I can't tell you about those guys. Noah, the fields are being measured by the degree to which they're divided, not by the extent to which they lean left (and even that's insufficient since Mankiw & Taylor are saltwater while many freshwater guys are Dems). So tax econ could be homogenous because they all lean right while labor is the reverse. Not that I believe that's actually the case. "Not sure about labor, but tax econ seems to attract people who think taxes are bad bad bad. Not the political left." Yes, including notable tax-hater Emmanuel Saez. Seriously, Noah? If you're going to say wrong things, don't be ferociously wrong. "Oh hey, I thought of one tax economist who doesn't think taxes are bad. This blogger Noah must be ferociously wrong! I will inform him of this fact, of which he is undoubtedly unaware, thus demonstrating my own brilliance to the world! But just in case, I won't post my name." If you have some overall perception that happens to exclude the top guy in the field (not to mention basically everyone else), then yeah, you're ferociously wrong, Noah. You do realize that the average person who reads this doesn't realize you have no idea what you're talking about, right? Do you have anything to contribute other than trying to determine the political 'sides' of different fields? Noah you are really wrong about the tax thing. Here is some name-dropping: Saez, Piketty, Chetty, Stiglitz, Diamond, Summers, Poterba, Auerbach, Gruber, Slemrod (Amy Finkelstein does not do tax, nor does Bernheim). These are clearly pro-government intervention people. Take the other side: Feldstein, Hubbard. That's it. Really it. Even the macro people doing dynamic public finance find role for taxation (Farhi, Werning). Moreover, the right-wing leaning departments just don't have PF economists! Chicago and Minnesota are the clear examples, but I'll be generous and include NYU and UCLA. The three top departments in PF (by leaps and bounds) are Harvard, MIT, and Berkeley, and then is your alma mater and Columbia. These are also the department consistently producing good students in PF. Even the conservatives in PF are quite well received by non-conservatives and work together. Feldstein hand-picked Chetty to be his heir. Is this possible that there are no cliques in finance just because there is only one official school of thought, not two? In this case, those economists willing to escape the fresh/salt water escape should better stay where they are ! No, there are large disagreements on ideas, and some very different ways of looking at the world. There's the big argument between behavioral and efficient-markets people of why prices mean-revert at long horizons. There are some cliques, but not as pronounced as in Economics. The issues addressed in Economics are FAR more consequential to the country, so you have more spirited disagreements. Wage Insurance vs Minimum Wage, for example impacts far more Americans than financial debates. Could be right. But why does finance attract those physicists more than macro? The math of macro is not that different from stuff you learn in physics. But I find that physicists are used to - even addicted to - the thrill of seeing that their theories work. In finance you can get that thrill. In macro you cannot. The econometrics result certainly looks odd, but econometrics is itself a very diverse field, so it could perhaps be that people are just working on different issues. Timeseries/macro vs psuedopanel/micro vs theory/applications etc. I think it's more that people in econometrics who work on different problems are doing things so far away from each other that their papers might as well be in different fields. That's also likely the reason that micro theory is also so high. Noah, could you explain the devide in econometrics to me, because I'm not entirely sure if I know what you mean. Is it the devide between the experimentalists like Angrist/Pischke and the VAR guys like Chris Sims? I remember some JEP articles where they critized each other pretty heavily. If you mean that, then I think the problem is derived from macro, since it is very hard to find natural experiments there (although there maybe some like in this Mafia-Paper). Actually I can't, because I don't even know what it is!! My somewhat educated guess is that it is structural (freshwater) versus reduced form (saltwater). Alternatively it could be due to the whole calibration versus ectrics thing in macro. Pure speculation: people inclined to cliquish behavior select, through some mechanism, to go into micro, macro, or econometrics. Perhaps also to stay in traditional econ departments rather than go into applied schools or departments? Maybe the division is being driven, in part, by the editing process at field journals? Perhaps econometricians need to cite the right folks to get into particular journals? Maybe lineage is some of it. Many of the foundational ideas in finance have their origins in both Chicago and MIT: Modigliani-Miller, Black-Scholes-Merton, Fama-Samuelson Efficient Market/ random walk, Lucas-Merton consumption pricing models, etc. I think the main drivers are the complexity/dimensionality of macro. Talking about macro with others can seem trying to because the tidiness one enjoy's with financial issues just isn't there. The implications of every this or that are endless and there are whole lot of thises and thats to think about. With that in mind, I believe imagination would be massively more important for macro than finance. For macro ideas to work, you have to have some idea how all these parts fit together with the decision making of millions/billions. So macro is the ultimate walk and chew gum side of economics--to do it well, you have to grasp a huge amount at once. So why two schools (I really was planning on getting there!)? Because almost no one wants professionally to really dig and do profoundly imaginative work! And I can't say I blame them! For one, the dimensionality/complexity and the need for imagination make it much, much harder to dazzle people. The (frequentist!) probability of being a meaningful contribution is vanishingly small. And in the rare case you offer groundbreaking insight, it is very likley that many others lack the imagination to really grasp your ideas, you know, like Mr. Keynes! So schools of thought coalesce around a few rare individuals who have had the luck to produce major-ish ideas that are some combination of understandable and helpful. Essentially, macro's difficulty means people (economists here) divide into two groups: a very, very small group who really produce new ideas and a near totality of economists that are almost entirely copiers, though they make minor modifications to the existing paradigms. This division means professionally it makes sense to stake out terriority and protect the queen bee (err, new idea producer) and that results in warring camps. There's a fundamental conceptual division in public finance between those who believe in omniscience (Samuelson) and those who do not (Buchanan). Xerographica, I've been curious for a while--do you consume anything other than lists of contextless aphorisms and your own internet feces? Anonymous, here's what I'm curious about. Do you think you hurt me when you attack me rather than my argument? Do you think it makes me sad? In a sense, it does make me sad because clearly you really hate my argument enough to attack me...but you're not smart enough to figure out how to attack my argument. Or, perhaps you are really smart...but my argument is so sound that you just can't touch it. So which is it? Are you stupid or smart? I'm smart enough to understand that demand can't be determined without a market. I guess that makes me smarter than Samuelson. But maybe I'm wrong? Maybe you have a sound argument for how demand can accurately be determined without a market? If so, then you would be the first. And the chances of you being the first is really really slim. Because if you did have a sound argument then you would have shared it rather than resort to an inane insult. Your 'argument' isn't worth the time to 'attack.' I'm just quite amazed that you've churned out so many blog posts that do nothing but repeat these contextless aphorisms. It's pretty spectacular! My argument isn't worth the time for you to attack? How convenient. That's exactly what somebody would say if they didn't want to admit that they were incapable of attacking it. Yeah, I have numerous blog entries on the same topic. You don't have anything that interests you enough to blog about? Maybe your cat or something? X was just working to make my comment more comprehensible. Read my last sentence then read his comment. Maybe the rest of my comment seems worth your time then! Noah: "Spatial proximity is also a candidate explanation, but doesn't explain why Berkeley cites Harvard more than it cites Chicago." Noah, O'Hare is not necessarily closer to Berkeley than Logan is - I use the airport names, because that's how people will travel. Traffic and flight availability will matter far more. "Spatial proximity is also a candidate explanation, but doesn't explain why Berkeley cites Harvard more than it cites Chicago." Boston winters aren't exactly known for being great. They're a different category from Midwestern winters, but they're still far closer to that than San Francisco Bay winters.
" public finance (taxes) and labor be more politicized than they are. Those are the fields that have the most importance for distributional questions, and distribution is what politics is mostly about. So politics doesn't seem like the main explanation here." From what I've seen, politics is a big big part of the explanation, misleading for the cause. I think libertarians and plutocrats don't go into public finance because they find government distasteful, and they certainly don't want to do research on how to make government perform better, that would just make it more popular, the opposite of what they want. And labor economics? Studying unions and the little workers? Very distasteful to libertarians and plutocrats. And libertarians tend to have a lot in common with plutocrats. Libertarian, your-on-your-own, don't-ask-me types are rarely people with serious problems and handicaps, or they would not at all be so gung-ho about this ideology. They're usually healthy white men who are doing very well, and are very secure, thank you very much. Of course, if there are currently, non-played-out good ways to hit at the government, unions, and small workers in these fields that would attract libertarians and plutocrats. They've already got that with standard Chicago School and neoliberalism; they don't really *need* actual research and facts (also see AEI, Heritage, Hoover, etc.). Might the simplest explanation for Econometrics be that it's a smaller, rather technical field? So since there aren't very many people in the field then there are probably a goodly collection of universities where there simply aren't people in the area to cite. To me finance is littered with cliques, or at least different camps. These range from value vs growth, fundamental vs technical vs quant, trader vs investor. Indeed in academic finance we have EMH vs behavioural etc. Financial markets are characterized by people disagreeing over what something will be worth in the future - why else would one person buy when another is selling? Higher-frequency data doesn't help when estimating mean returns (Merton 1980). So there is still plenty of disagreement about how predictable returns are, what predicts them. And for the "why?" question data is no help at all. You can come up with a dozen rational models and two dozen behavioral models that will explain the same thing. In econometrics it seems to me that the main disagreement is over how seriously to take the restrictions imposed by rational expectations, Lucas critique and all that. You seem determined to "prove" this divide exists, but you're missing the point. We know how research proceeds. Suppose, for example, that someone comes up with something they call a "New Keynesian model." He or she teaches this to his or her students, and other scholars in the profession pick up on the idea. Of course, we know there are externalities and scale economies in research, so the people who work on this thing tend to congregate at the same conferences, and in the same academic and non-academic research institutions. They cite the work they see, which is confined to what this particular group does. So, you're going to see the patterns that are being picked up in the data that Onder and coauthor looked at. But, to understand what is going on, you have to look at what people are actually doing - what are the ideas that are being passed around? The smart people - the innovators - are paying attention to everything. They're like good musicians who can play jazz, rock and roll, punk, post-punk, whatever. So, among the innovators, there is a lot of cross-fertilization. Then there are a lot of followers. So, Mike Woodford, who is an innovator, adopts wholesale a load of ideas from people you might want to call freshwater, tweaks that in ways he finds interesting, and he calls what he does "New Keynesianism," so the former saltwaters can identify with it. But it's really more fresh than salt, though I'm sure you want to call it fresh. And, I can identify research institutions that are forward-looking (Princeton for example) where there are a lot of things going on that we would call macroeconomics, and that have nothing to do with some divide in the profession people thought about in the 1970s. New ideas entirely. Kind of pointless to be thinking about this actually. Focus on the ideas. Forget about constructing some war scenario. This may get you blog readers, but it's not a helpful way to think about the evolution of ideas. Stephen, how's that high inflation coming along? Apparently you haven't been reading my latest stuff. In particular, pay close attention to "Noah's Complaint." Following your own line: in Econometrics you have every kind of data, so you have the best information. But you also have a lot of noise. Maybe the division in Econometrics is the result of a low signal to noise ratio. "All the Wall Street people care about is making money, so good science gets rewarded." Seems to me that it's short term thinking/science seeing as Wall Street would have vanished in 2008-2009 had the taxpayers not bailed them out. As it was many firms went under or were absorbed: Lehman, Bear Stearns, Merrill Lynch, Wachovia, WaMu, IndyMac, etc. etc. Well, theft is rewarded too. That needs to be in the story. This makes it much more interesting. Here's an interesting case in point. As far as I know, no one has serious quarrels with John Cochrane's views on finance, or his academic papers in that field. But, in terms of popular macroeconomics, there exists a group of people intent on attempting to show the world that John Cochrane is a complete idiot. That's the same person. How could it be that Cochrane is such a good financial scientist, and such a poor macroeconomic scientist? Because John Cochrane is highly political and his work on macroeconomics is politically charged. It's the same reason the economics profession takes Krugman seriously on trade issues but thinks he's a lying ideologue when it comes to macro. Also, the divide obviously exists. I don't get why you're so intent on pretending like Economics, and Macro especially, isn't incredibly juvenile and cliquish. Whether it's Larry Summers dishing out some burns on Minnesota/Chicago or if it's McGrattan and Kehoe laying into Keynes. There's a divide. I don't believe it's entirely about ideas. You acting as if you're above it is dishonest. "How could it be that Cochrane is such a good financial scientist, and such a poor macroeconomic scientist?" Because prices in financial markets are not sticky while they are in product and labor markets? Steve - Good comment, I'm bumping it. Steve, also, who do you think is selling shlock pseudo-science to our policymakers? I understand you probably can't name names (other than "Krugman"), but what sort of currently popular ideas or models do you consider pseudo-science? New Keynesian stuff? Financial-friction macro? Let's leave names out of it. We'll just say this happens from time to time. "Because prices in financial markets are not sticky while they are in product and labor markets?" What are you saying? Are you making an empirical observation, or saying something about what has to go in a macroeconomic model? In the first case, nobody cares if they are "good science". Only if things sound sophisticated. That's the majority of sophisticated /quant modeling at big banks. 1. If you look at the issue of regulatory capture, which led to the repeal of Glass-Steagal, it will fairly clear to anyone willing to be objective, that that particular malarky led to banks getting hugely leveraged, gushing profits for an extended period and essentially competing for "trades" with private pools of capital for all manner of bets (why do you think certain Hedge Funds wanted to build the next Goldman Sachs?) . The "research" backing the repeal, relied heavily on the water carried by a number of prominent economists and finance professors (no names!). 2. The typical day-to-day activity of trading desks are, especially derivatives desks are carried out using decently precise PDE-based models that are calibrated to market prices. Not much room for bull there. However if you think about how short rates are set (or have been "fixed" in recent cases) will provide you with a peak into the working of the "free market system unshackled" which you like so much. But I digress a bit here. Rates, Equities, Volatility, Commodities are essentially traded on fairly free markets that operate within lanes set by regulation (that fail at times). 3. " ....plenty of schlock macro pseudo-science" that you are attempting to be smarmy about, has been anything but what you describe it as. In fact people who were willing to listen and follow that advice, did really well. Did you come up with your reverse-causality model back in 2008? If so people listening to you should have been buying bonds! Did they? All indications from the usual suspects following the Chicago brand appear to have been caught trying to sing to the "Hyperinfaltion!" trope for their Bar Mitzvahs! 4. It is clear to me that a number of prominent macro professors are in the process of doing some heavy back-pedalling at the moment, to catch the policy trend that seems to have caught the drift. I think the mechanism that Mr. Williamson posits supports string theory in its competition with other theories in physics. I don't see the politics in Cochrane's blog posts. Seems he wants to spend time thinking about models and how you use them to give policy advice. Yes, what I really like about Cochrane is that whatever his initial reaction to something, he always goes back and thinks about it in careful detail, and when he thinks about it carefully he is extremely fair. You can see this with his recent foray into the mechanics of New Keynesian models. Of all the responses I thought I might get, a flat denial of Cochrane's blogposts being politically charged is the stupidest one. It's also tedious. I'm not going to go find a million of his quips to quote just to prove you're being coy. I definitely do think Cochrane's posts are politically charged. But they're still (usually) good. That's fine. I agree. I've learned a lot from Cochrane's blog. Steve does not agree with you or me, and seems intent on lying about something minor for no obvious reason. Comparing two Chicago econ bloggers, Cochrane seems the more rhetorically political (he even links to Cato on the sidebar), even while his economics papers might not be so politically charged. Casey Mulligan's work on labor economics is highly politically charged, touching on a central dispute over redistribution, but he's usually careful to take a tone saying the labor market effects are not enough to determine what policy ought to be since we trade that off against helping the recipients of redistribution (Megan McArdle would be an example of someone who roughly accepts his positive conclusions but favors UI extensions anyway). So Fama and Shiller are best buds? "Update 2: Seeing Williamson's comment, Matt Yglesias points out on Twitter that successful macroeconomic modeling should be in huge demand on Wall Street. For example, if Wall St. firms were to learn that QE really does cause deflation - as Williamson's recent paper alleges - they should be able to make enormous profits." He's on the right track. But there's more too it than "QE causes deflation." The right way to state the proposition is that, if it does anything, QE will lower the inflation rate over the long run. And the long run comes sooner than you might think, i.e. if QE gives you a short-run increase in inflation, then if it's like typical monetary easing, then that effect lasts only a year or two. More to the point, there are other forces post-financial crisis that will cause the real interest rate on safe assets to rise, and inflation to fall further, so long as the Fed keeps short nominal rates at or near the zero lower bound. And there are good reasons to think that the Fed will be stuck at the zero lower bound indefinitely. Conclusion: expect less inflation rather than more. That has to matter for your portfolio choices. "More to the point, there are other forces post-financial crisis that will cause the real interest rate on safe assets to rise, and inflation to fall further, so long as the Fed keeps short nominal rates at or near the zero lower bound." So it's not actually QE that is deflationary (which is what people seemed to think you were saying), but "other forces". Could you give some more details on what these other forces are? Yes, some people don't read. The financial crisis effectively created a low supply of safe liquid assets - the assets we use in financial exchange and as collateral. That effect is very persistent, but you would expect it to go away over time, as the financial system repairs itself. The low supply of safe liquid assets makes the real interest rate low, and as the financial system recovers the real rate rises. If QE has an effect, by shortening the duration of safe assets it makes the stock of safe assets more liquid, and will also increase the real rate. But the effect of QE could be small. I think these other factors matter more. Saying QE has led to disinflation makes no sense. What it tells us now is that as private and corporate deleveraging continues, the slack has to be absorbed. It is a simple but tenacious detail that will not leave us just because some video-game model of economics tells us so. All of this obsession, yet you still haven't provided a decent definition to distinguish between saltwater and freshwater macro, forcing us to keep thinking that you mean New Keynesian vs. non-New Keynesian. The study you cite literally uses geography, which doesn't actually tell us much about methodology. In the Twitter conversation between Miles Kimball and me, he basically admitted that most people are working in a grey area and that your article intentionally used the most extreme version of the freshwater mindset as a punching bag. The caricature that you two painted in your Quartz piece of extreme RBC vs the wise saltwater sages who incorporate frictions is totally bogus, as nobody is working with bare-bones RBC. Rather, RBC types are incorporating lots of frictions that provide huge bang for buck in terms of explanatory power. The main remaining difference now is that RBC frictions can get big results from small changes to the model, whereas the saltwater types are just curve fitting by throwing in enough shocks to get the model to do anything the data do (eg CEE, S and W, etc). These guys don't even hide what they're doing--in some cases, they literally calibrate the model to match impulse response functions from the data; in other words, they assume the result. Maybe you think that throwing in a bunch of ad hoc frictions that make it impossible NOT to match the data is "explaining" things (as you termed it in Quartz), but it's not. You can keep barking up this tree, but you need to be honest with your readers about what exactly divides the fields. I raised some of these questions here: http://updatedpriors.blogspot.com/2013/11/what-constitutes-freshwater-macro.html; you responded not by resolving the problems but by claiming that you had done so in an early draft. Show us! I don't know if this is of any help but my own experience dealing with some econometricians is that purity(only practicing econometrics) is kind of rare. Finance people generally tend to be more time-series oriented so I don't think its helpful to just categorize things into econometrics. If anything at least separate it into Financial Econometrics and see what happens next. I found an economic theory on the internet that can make predictions on the stock market from which both the recession of 2008 as the flash crash of 2010 could be and have been predicted. It's all based on some economic theory of this crackpot guy. Unfortunately lately the formula seemed to stop working. I don't know why.